For other uses, see Changing room (disambiguation). A changing room, locker room, dressing room (usually in a sports, theater or staff context) or changeroom (regional use) is a room or area designated for changing one's clothes. Changing rooms are provided in a semi-public situation to enable people to change clothes with varying degrees of privacy. Separate changing rooms may be provided for men and women, or there may be a non-gender-specific open space with individual cubicles or stalls, as with unisex public toilets. Many changing rooms include toilets, sinks and showers. Sometimes a changing room exists as a small portion of a restroom/washroom. For example, the men's and women's washrooms in Toronto's Dundas Square (which includes a waterplay area) each include a change area which is a blank counter space at the end of a row of sinks. In this case, the facility is primarily a washroom, and its use as a changing room is minimal, since only a small percentage of users change into bathing suits. Sometimes a person may change his or her clothes in a toilet cubicle of a washroom. Larger changing rooms are usually found at public beaches, or other bathing areas, where most of the space is for changing, and minimal washroom space is included. Beach-style changing rooms are often large open rooms with benches against the walls. Some do not have a roof, providing just the barrier necessary to prevent people outside from seeing in. Changing room sign of swimming pool at Keangnam Hanoi Landmark Tower, Hanoi, Vietnam. Various types of changing rooms exist. Changing stalls are small stalls where clothes can be changed in privacy. They are used for swimming purposes. 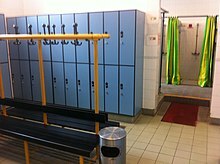 Locker rooms are usually gender-specific spaces where clothes are changed and stored in lockers. They are often used for swimming or other sporting purposes. They are open spaces with no stalls. These rooms contain lavatories and showers. Fitting rooms, or dressing rooms, are usually small single-user cubicles where a person may try on clothes. These are often found at retail stores where one would want to try on clothes before purchasing them. Green rooms and trap rooms are usually mixed-gender backstage or under-stage changing spaces found at theaters and other similar venues. Changing stalls are small stalls where clothes can be changed in privacy. Clothes are usually stored in lockers. There are usually no separate areas for men and women. They are often combined with gender-separated communal showers. Most public pools have changing facilities of this kind alongside communal changing rooms. Locker rooms are thus named because they provide lockers for the storage of one's belongings. Alternatively, they may have a locker room attendant who will keep a person's belongings until one comes to retrieve them. Locker rooms are usually open spaces where people change together, but there are separate areas, or separate locker rooms, for men and women. Sometimes they are used in swimming complexes. Locking devices used in locker rooms have traditionally been key or coin lockers, or lockers that are secured with a combination lock. Newer locker rooms may be automated, with robotic machines to store clothes, with such features as a fingerprint scanner to enrol and for later retrieval. Locker rooms in some waterparks use a microchip equipped wristband. The same wristband that unlocks the lockers can be used to purchase food and drinks and other items in the waterpark. Some communal changing rooms are only supposed to be used by groups of persons, not individuals. In this case, there may be no lockers. Instead, the entire room is locked in order to protect belongings from theft. Locker rooms are also used in many middle schools and high schools. Most of them include showers for after Physical Education. Fitting rooms, or "dressing rooms", are rooms where people try on clothes, such as in a department store. The rooms are usually individual rooms in which a person tries on clothes to determine fit before making a purchase. People do not always use the fitting rooms to change, as to change implies to remove one set of clothes and put on another. Sometimes a person chooses to try on clothes over their clothes (such as sweaters or coats), but would still like to do this in private. Thus fitting rooms may be used for changing, or just for fitting without changing. Retail establishments often post rules such as maximum number of items allowed in changing room, e.g. "no more than 4 items allowed in changing room". In any case, Buster Keaton worked in one in an American 1928 silent comedy The Cameraman. Since then, they have continued to provide comic scenes in films, for example in the 1995 French film Les Trois Frères. A green room is a room located backstage in a theatre or some such performance space where the actors (musicians, dancers etc.) wait before they go onstage. One theory of its naming is that it traditionally has green walls; as green is considered to have a calming effect and is meant to bring focus before the performance and calm nerves. Another is that performers in the green room are "Green to go", ready to go on stage. Green rooms are usually located backstage, but sometimes under the stage, or to the side, they can also be located anywhere where there is room to put a communal space. In exhibition halls and convention centers, Pipe and Drape "rooms" may be constructed as a Green rooms. Green rooms are usually not separated by gender, because performers often change in separate, usually gender segregated, dressing rooms and congregate in the Green Room, once largely or completely in costume to help each other focus and calm nerves of other performers. Green Rooms may be separated by performing group, or the main headliner may have their own Green Room, and the supporting acts share another. Green rooms are often also used on non-show days and during the install and strike of productions as a break room or meeting room, and may contain a fridge, microwave, coffee machine, or water fountain. In the large shopping malls and in a few shops where a special room is designted as try room which means you can try your attire there. It is available almot every readymade clothing shops. In larger Victorian houses it was common to have accessible from the bedroom a boudoir for the lady of the house and a dressing room for the gentleman (see also his Cabinet (room)). Before the advent of modern plumbing, there existed a number of places for washing one's clothes and body. Cleansing stations were separated by gender, and combined the function of cleaning clothes with cleaning of the body. The closest modern equivalent would be a combination laundromat plus locker room with showers. During the nineteenth, and early part of the twentieth century, the increase of urbanization caused an increase in the spread of disease. Poor hygiene was determined to be the cause. Since many families did not have practical means to clean themselves or their clothes, public cleansing stations were established for their use. Because of the privacy afforded by changing rooms, they create a problem in the trade off between security and privacy, where in it may be possible for crime to be perpetrated by people using the cover of privacy to sell drugs, or steal clothing from a department store. Some department stores have security cameras in the changing rooms. Communal changing rooms pose less of a risk of theft than fitting rooms, because there is not total privacy. In particular, the perpetrator of a crime would not know whether or not other users might be undercover police or security guards. Many modern changing rooms often have labyrinth-style entrances that have no door, so that people outside cannot see in, but security can walk in at any time without the sound of an opening door alerting persons inside. Washrooms in which changing clothes is merely a secondary purpose often also have such labyrinth openings. Many washrooms have security cameras in the main area with a view of the sinks and the urinals from a viewing angle that would only show the back of a user. However, when a washroom is located near a fountain, wading pool, or the like, and is likely to be used for changing clothes, some believe that washroom surveillance cameras would be a violation of privacy. Another security risk present is that of theft. Sometimes no method of securing items is provided, but even lockable lockers or baskets are usually designed for only minimal security allowing experienced thieves to steal the valuable items which people typically have with them before changing. Changing room operators frequently post signs waiving responsibility for stolen items, which discourage but do not eliminate claims for negligence. ^ a b c d e « Essayer en corps. Sociologie des cabines d'essayage », Thierry Caro, mémoire de fin d'études à l'Institut d'études politiques de Lille, 2004. ^ "Gym Locker Theft in Bangkok". Archived from the original on 2013-03-13. ^ "Mysterious gym locker theft leads to string of troubles".